If your ears are stretched and you wear plugs or hanging jewelry in your ear piercings, daily cleaning of your earrings is a necessity, according to Infinite Body Piercing. Stretched ears with earrings, commonly called "ear gauges," do not allow for dead skin cells inside the earlobe to fall off the earlobe. When you insert earrings into your stretched earlobe piercings, the dead skin cells attach to the earring and are trapped in the inside of the earlobe, according to One Tribe Organics. The trapped dead skin cells, which are a yellowish-white color, emit a foul smell when your earrings are not cleaned on a daily basis. Remove your plugs from your ear piercings. 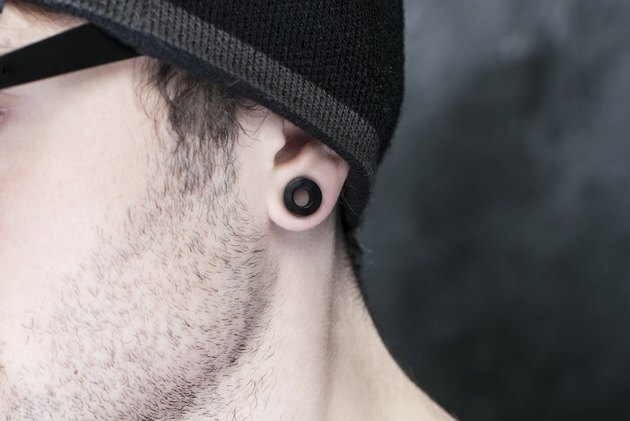 Plugs are the correct term for cylindrical-stretched ear jewelry, although many refer to the jewelry as "ear gauges." Squirt a dime-sized amount of liquid soap onto your jewelry. Rub the soap on the outside and inside of the plug while allowing warm water to run from the faucet of your shower or sink onto the earring. Wash the earring until dried dead skin cells and dirt are no longer present on your earrings. Rinse your earrings with cool water, and then dry them with a paper towel. Drip a small amount of oil, such as emu or jojoba, onto a clean cloth. Rub the cloth on the inside and outside of organic plugs. Organic earrings are made of bone, wood or horn. Oil is not necessary for cleaning steel or acrylic plugs. Lather your hands with liquid soap and warm water. Insert one finger into the inside of your earlobe piercings. Rub the soapy finger in a circular motion along the inside of your earlobe piercing. Repeat for the outside of your earlobe piercing and the front and back of your earlobe. Insert the earrings into your earlobe piercings while your ears are still wet for a lubricated insertion. Dry around your ear piercings and jewelry with a paper towel. Insert earrings immediately after cleaning to avoid contaminating the earrings with bacteria from your bathroom sink or shower. Never use harsh products, such as alcohol, to clean organic earrings. Why Do My Pierced Ears Smell?